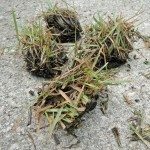 My neighbor says you can't use rotary mower on zoysia grass because it will pull it up or give it a very ragged appearance. Is this true? New plugs are always more delicate, but once Zoysia has taken hold, it's a really tough grass and your rotary mower will do just fine. As for the ragged appearance? I don't think you'll see a difference. 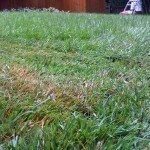 Zoysia has a different texture from other lawn grasses and placing one next to the other may account for the ragged appearance.